In this release we feature loved libraries, Dina Pen, leadership, bookmarks, library worker skills, pedometers, and Steve Marks. Road trip! What does a librarian do while on vacation? Visit and sketch libraries of course. 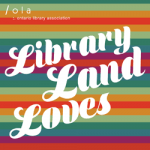 As part of her inventive (and creative) Incidentally column Amanda Etches brings us All the Libraries I <3: Summer 2016 Road Trip Edition. Random Library Generator (a random interview with an OLA member) returns! This time it’s Dina Pen. Communications professional and biker (think Harley not Schwinn). CEO Bessie Sullivan asks “What Makes a Library Leader?” and discovers the answer among the participants in an intensive leadership program. How do you mark your spot in a book? Some people fold down corners but most people use a bookmark … of some sort. Julie Wendland goes public with her obsession with bookmarks in an article entitled …. Bookmarks! Why Do Library Workers Not Have the Skills To Meet Community Needs? “The simple answer to this very Big Question is ‘because they are Library Workers’. In other words, they are trained in all of the aspects of providing library services, but they do not have the key skills that are required to identify, prioritize and meet community needs.” John Pateman takes on an important issue for every library in his Open for All? column. No matter how hard we try, for many libraries are about books. And we are, but we’re also more than that. In the second of a series of articles curated by Catherine Coles called More Than Just Books we hear from Tania Sharpe and Pedometers at Chatham-Kent Public Library. Sarah Macintyre’s The Library IT Crowd interviews have introduced us to some of the wonderful technology folks in our libraries. This time it’s Steve Marks from the University of Toronto Libraries.